Following Rich's presentation, Linda Darby, Chief Executive Officer, shared two powerful industry-wide projects that can have a positive impact on our future. She first discussed the ZMET study conducted by Olson Zaltman Associates for the Funeral Service Foundation. The goal of the consumer study was to better understand what modern consumers are seeking in an end-of-life service or ceremony. The results were striking. Consumers felt like most traditional funeral services were like a lonely, lifeless tomb. They described feeling alone, uneasy and controlled. When the consumers were asked what they wanted their end-of-life services to be, they uniformly said they wanted it to be their "crowning performance." They wanted to be the writer, director and star. An overwhelming theme of "I mattered" connected all of the consumer comments. They were looking for a ceremony that helped their loved ones transform and heal while sending a clear message that the life journey continues. 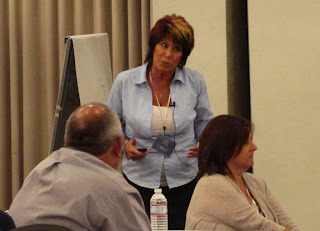 Linda also partnered with Kimberly Fantaci, NCVBA, to discuss FAMIC's "Have the Talk of a Lifetime" campaign. We've talked about this exciting campaign and the best ways you can get involved in previous editions of Trigard Tuesdays. There are easy and free ways you can encourage consumers in your area to talk about their final wishes. If you need a login to access the materials on the FAMIC site, call Trigard Customer Service at 800.637.1992 or your national funeral association.